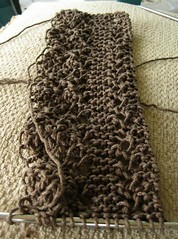 I love knitting, I love the way the stitches look and they way patterns work out. 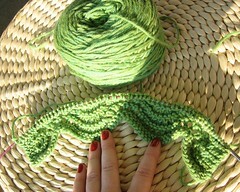 I love picking out the yarn and matching it with a pattern. 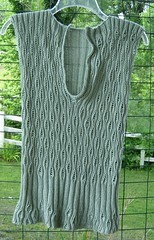 But the thing about knitting for other people is you never know if they love it. I mean it’s one thing to buy something, give it to someone and have them stick it in the back of the closet and never use it. 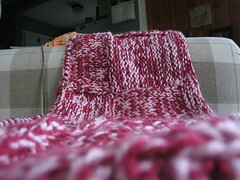 But it’s another when you put the time and care into something that it takes to make a knitted gift. I’ll be making one more blanket for my other niece, but then I think I might be done giving knitting for gifts, other that to my parents. I know they like and wear what I make for them. In fact my dad requested another hat. That said I think this will be used. 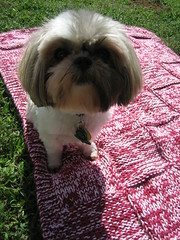 I used a low maintenance yarn that can be washed easily and should create an allergy problems. My niece has a lot of allergies. Since I haven’t measured how big it is I left Simon in the picture for gauge. Plus he’s such a camera hog it’s hard to get a picture without him. 🙂 the one at the top cracks me up because it looks like he has a HUGE head on a tiny body. 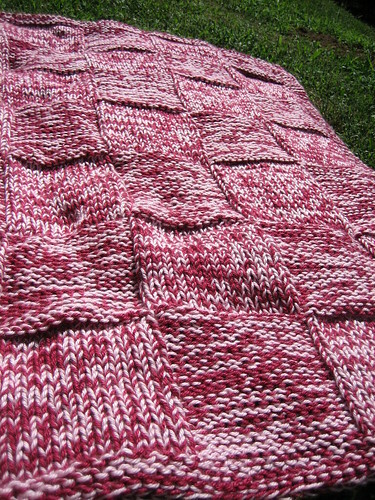 Pattern: My own, there is something to be said for the simplicity of a pattern created with double stranding and a basic checkerboard pattern. 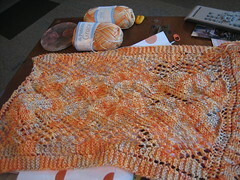 Here we have another installment of the sporadic (on my part) WiP it Wednesday. I think the idea is to shame you into finishing projects so you’re not showing the same picture every Wednesday for 6 months. Of course you could not show the picture and deny you’re working on anything. 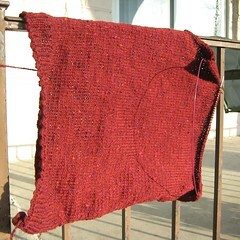 But really if you’re at the point, lying to you fellow knitters, well, I think it’s intervention time. First up the Mini Cardi that we’ve heard so much about lately. I’m done with the arm hole shaping and working my way up. Like it? Want one of your very own? Join the KAL 🙂 Yeah Yeah I know it’s August and hot as hell and you can’t even think of wearing wool. I cast on for this on Sunday, so it’s shame free. The Simple Throw is still on the needles, it’s too hot to have a big acyclic blanket on my lab, luckily it’s a Christmas gift so there is no hurry. The desire to not have heat stroke over rides all shame on this one. 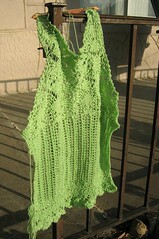 The Lace Tank , well it’s sort of on hold because I only have one set of size 6 tips for my KnitPicks options and I took them to use in the Mini Cardi. Yes I realize with the weather and what not I should focusing on this because it’s something I can actually wear. ha ha ha. I am the Queen of Denial. 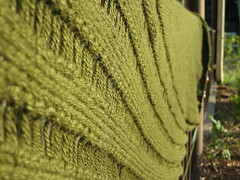 If I knit for Fall, Fall will come. Right? RIGHT?!?! 😉 ok fine slight shame. 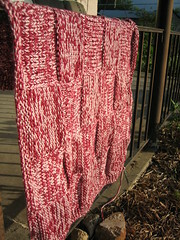 Along those same lines we have Clapotis , in which I come very late to the party. Let’s call it fashionably late, shall we? No need for even more shame. This is going to warm and lovely when done. I’m only worried it will shed on my clothes, I envision wearing it over a black top, so every little strand will show. *le sigh* I’m happy with my yarn choice (Andean Silk from KnitPicks) but a little worried I wont have enough yarn to make it as long as I’d like. How much does this stretch when blocked? And here comes the unavoidable shame part. 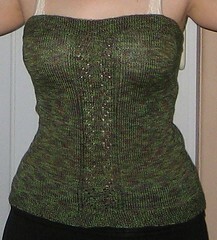 I still have not finished the straps for Mentionable . I should be wearing this gorgeous top. It seems ridiculous that this isn’t done jsut because of the straps. I’m going to go by Joanns to see if I can find something suitable to sew on for straps. Any suggestions? Thanks to the dreary weather I ended up having Friday night off work. It’s my first weekend night off in two months, plus it coincided with our happy hour at work, so I was able to head to my favorite local Irish Pub with my coworkers. Plus they now have Smithwicks on tab, it was a prefect Friday night, I had a couple of beers, the world’s best chicken strips and went home early. 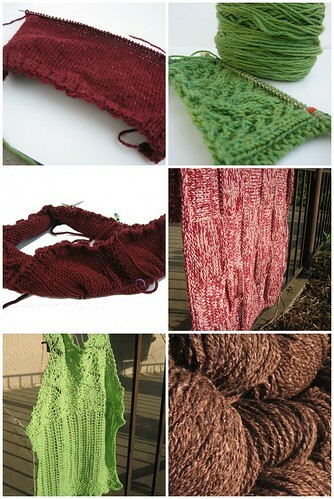 In knitting news. I’ve found my next two projects, hopefully I’ll have time to cast on next week. 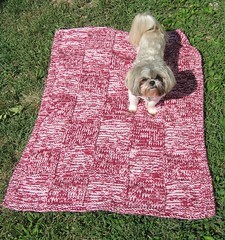 I know I wont have time before the 4th so I started something easy, a blanket. I bought the yarn to make blankets for my nieces for Christmas a couple of months ago and Christmas will be here before I know it. 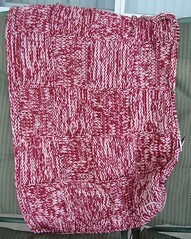 Because I wanted soft and machine washable I went with Caron Simply Soft. I’m still working away on my Scarf from Victorian Lace Today, I finally got the first Harry Potter book on CD in so I’ve been listening to it and knitting away. 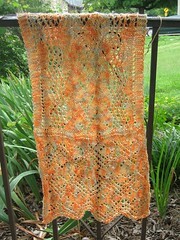 This my first lace project and I used Paton’s Grace. I didn’t want to use expensive yarn for my first attempt in case I hate it and I really loved this color. My next two projects the Lace Tank and the Lace Cardigan both from the Vogue Knitting Summer 2007 issue. 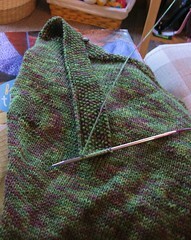 After the tank and the scarf I hope I’ll feel confident enough to tackle this Cardigan. I really love it.